August 24, 2010 5 P.M. Guess what I have a Confirmation Shipping Code from USPS today for? 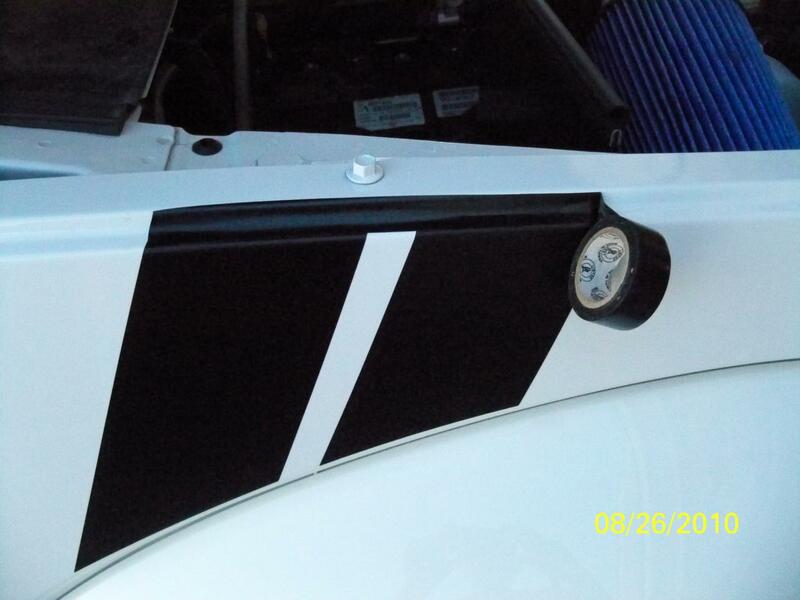 Yes the very first set of custom made Nitro Detonator Type hood/fender strips. 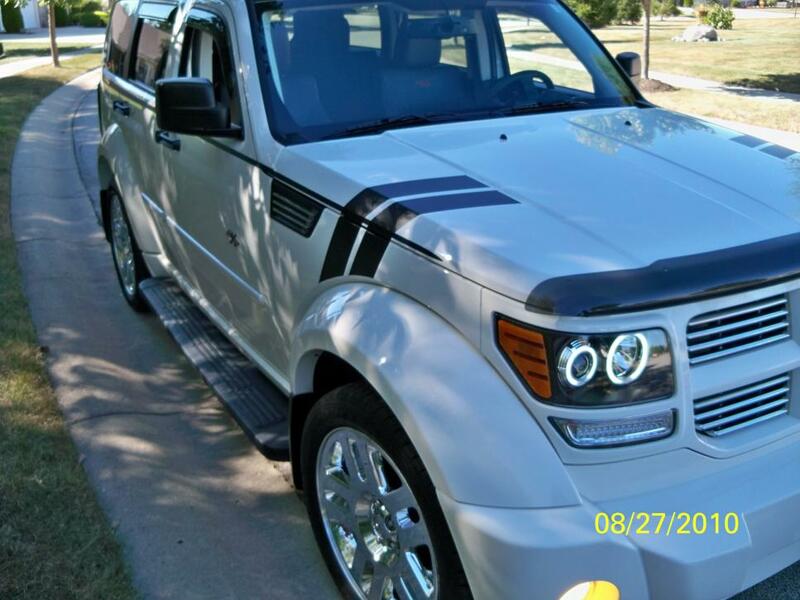 When I saw these way back in January installed on a new 2010 Dodge Nitro, Detonator shown by Chrysler, I told my Wife this was my next Nitro “project”! Waiting and waiting to see a set installed at the Local Dealership on a new 2010 became in vain when as far as I can tell, none have ever been installed by the Factory in 2010? I like to do these types of installs and modifications up here in Indiana in the summer when it is real sunny and because of the heat, the install after installation can bake in the sun! This has worked flawlessly in the past on anything that involves adhesives like decals, wood type dash kits, spoilers, vent visors, and so on for me. As summer wastes away I contacted Kelly at elitelimit asking about an aftermarket kit just two weeks ago. 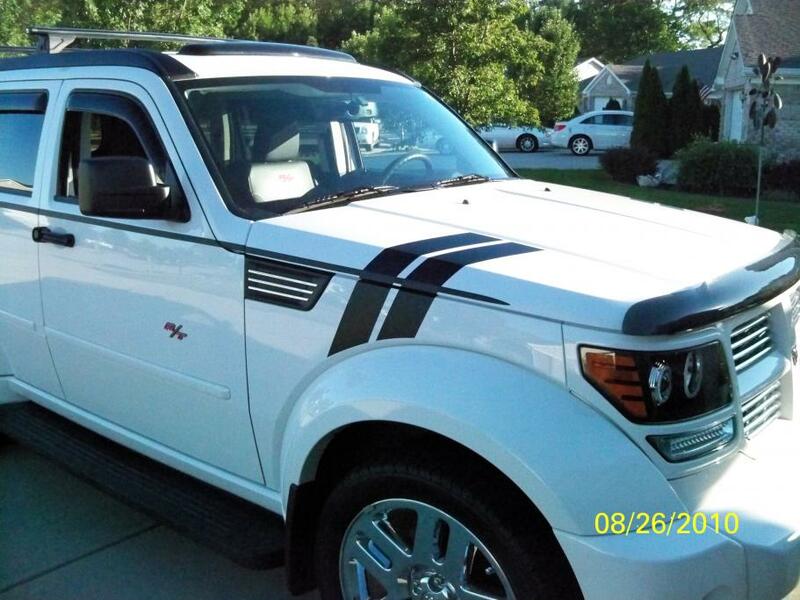 See two years ago I purchased their aftermarket Nitro Hockey stripe kit and installed it myself and was very pleased with the results. After some discussions with pictures he agreed to go to his local Chrysler Dealership the very next day, and make a template. WOW! 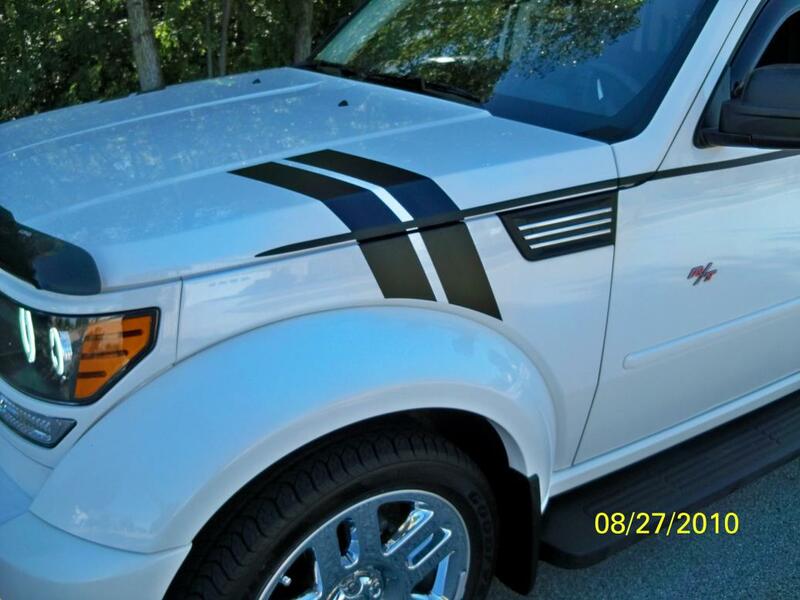 I told him that I was sure other members here besides me might want these aftermarket stripes to update their ride, too. Why these strips never made production in 2010 or what will be installed on the 2011s remains a mystery. Have read some reports they will be silver or even the design could change. 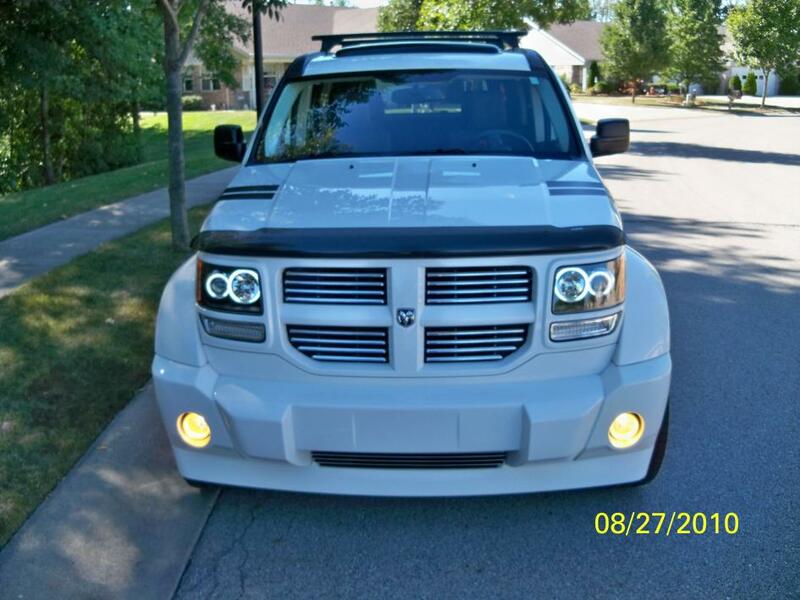 I did not want to wait another year to add hood strips to my 2007, or even wait till the 2011 Nitro is introduced next month. Mine are in matte black, but semi-gloss or glossy black are an option. These will match my previous installed strips. At least 16 colors are available to order and if I owned a black Nitro I would go for the red color as I have seen on the Challenger R/T. They are way cool! Plan to install myself this weekend and will post pictures of the install and final results, so check back! Another interesting point Kelly brought up was about the price. I told him I would have already ordered a set from my local dealership’s parts department, accepting the fact they would be expensive, if available. He told me that replacement factory decals usually are not sold in pairs but right or left so they could be double expensive. I had not thought of that, but I’m sure that is the case. For a direct LINK to these strip kits click HERE! 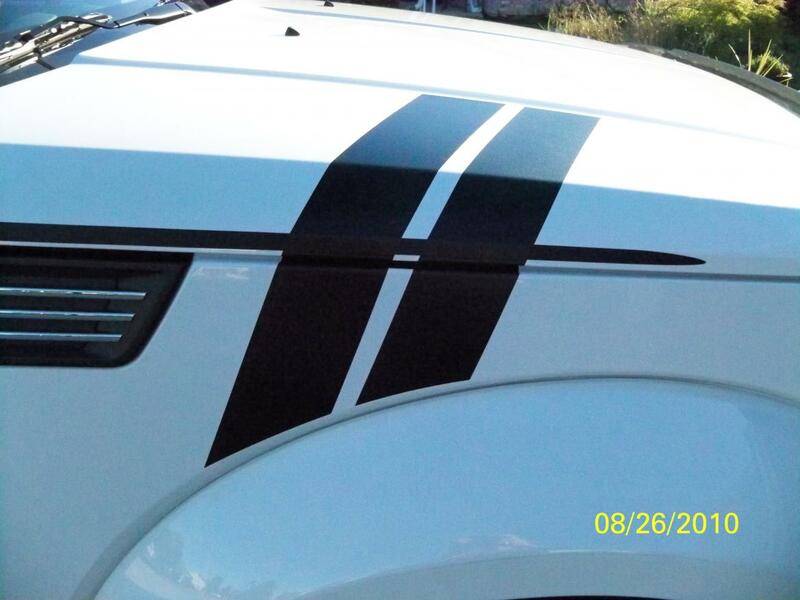 To view other Nitro Striping Kits besides my Hockey Stripe and and the NEW"Muscle Hood" use this LINK and hit the Support Tab at the top and scroll to view Nitro Truck Rocker and Nitro Quarter Strip. I am so pleased to offer our Members here a first on the availability of these very cool stripes. Enjoy and if you add these (or other kits) to your Nitro please post your pictures here. Thanks! O.K received strips about Noon today and had to install. 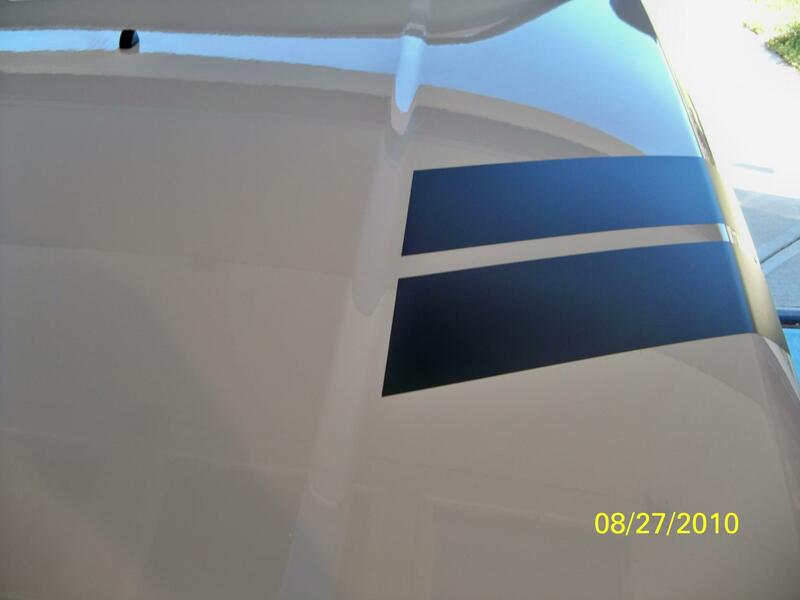 These are pictures of installed strips with more detailed install step-by-step pictures, coming tomorrow. (picture are always better that written ones). Will clean up the Nitro for better shots. Was a easy install with great results! 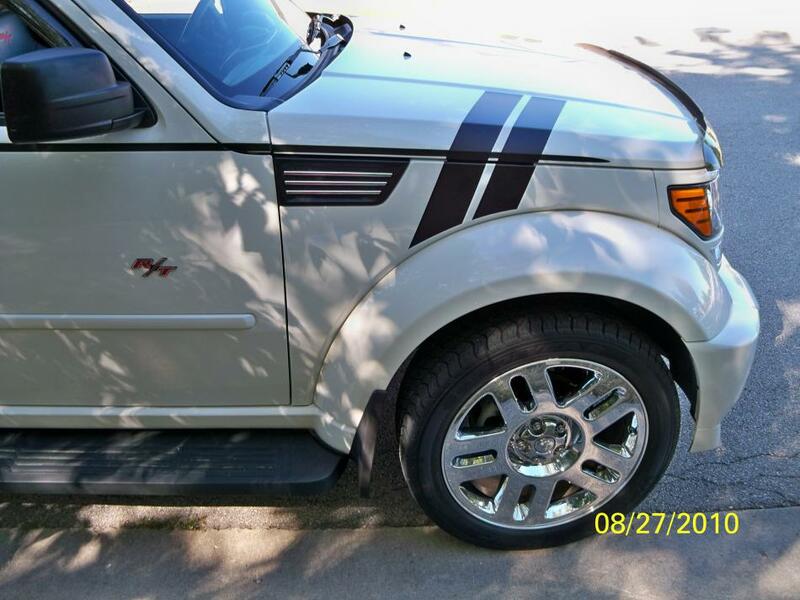 Having read my previous Thread concerning availability now of Dodge Nitro Detonator Type Custom Hood and Fender Strips, I have started another one involving just the installation of the first public set, on my 2007 Nitro R/T with previously install "Hockey Decal Stripe" . I can honestly say they could not be any decals easier to install! However placement could be problematic if care is not taken before the install. Elitelimit’s application instructions are superb as well as their placement diagram however I chose to be more focused on alignment of the bottom arches on the fender flairs THEN being parallel to the hood crease lines. 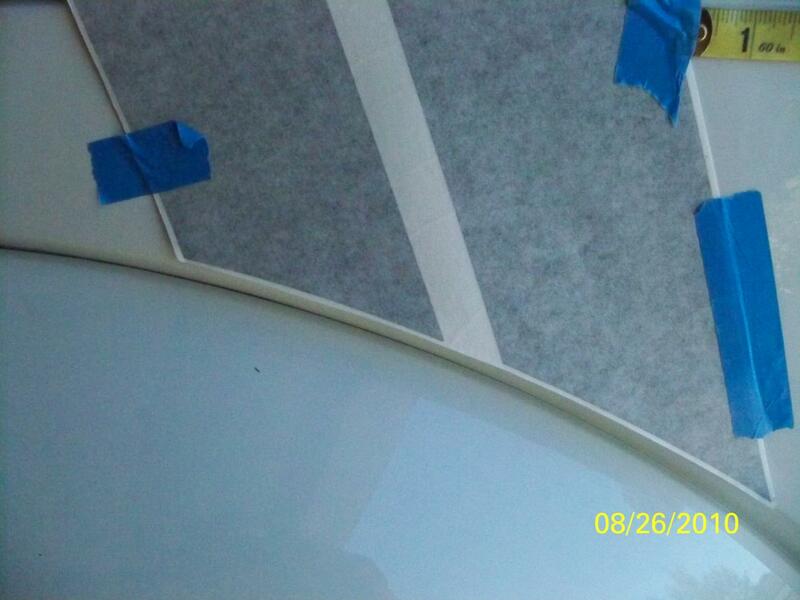 I chose to create a painters tape template before the install to gain my preferred location. Others may just disregard my thoughts but the center lower (outside) hood crease line is really hard to use as a reference point that will determine the lower alignment to the strips to the fender arches. Again these are really easy to install yourself, but you could pay a local trim shop to install for maybe $100, if you wish. I am not a detailer, just an average Joe that has installed two decal sets in the last 20 years, both on my Nitro. This is the only area that needs to be cleaned for the decal install and I did use denatured alcohol this time purchased from Home Depot. Remember to also clean the inter hood lip and fender lip in this area too by raising the hood that will be used when you cut the decals in this area. I placed the decal so that the bottom arches aligned with the fender flair arches and was also parallel with the two hood crease lines but not touching the outer one. I used the following measurements to receive the alignment and placement I desired. Yours could be different but these would be a good starting point. After removing the paper backing (see wet application method) I sprayed the total area and the back of the decal set with the soap solution. Flipped over and aligned with my masking tape guide and started installing using an old credit card and fingers and later pealed away the transfer tape. Continue to spray as much as you need to. It was 77 degrees, perfect for this install in the garage. 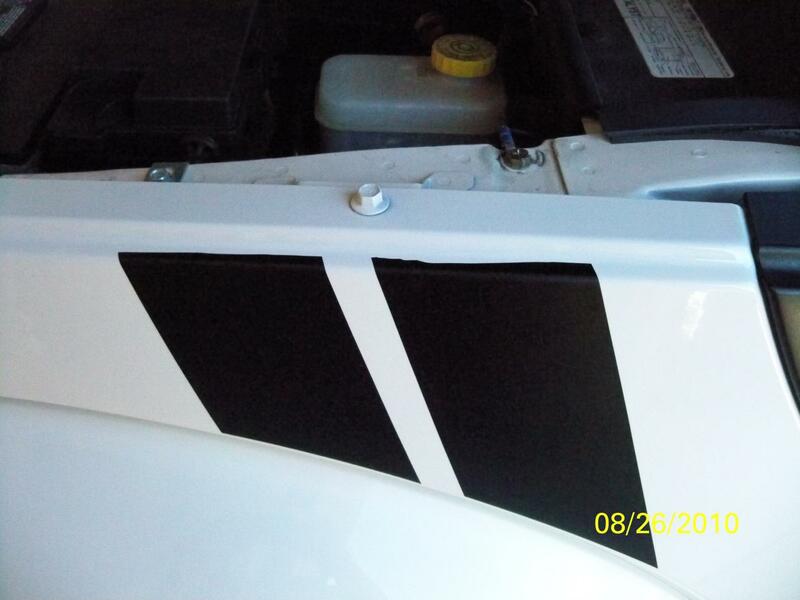 You should try and stretch the installed decal at the hood/fender line before cutting with a straight edge. Then wrapping any excess to the hood and fender lips, after opening the hood. 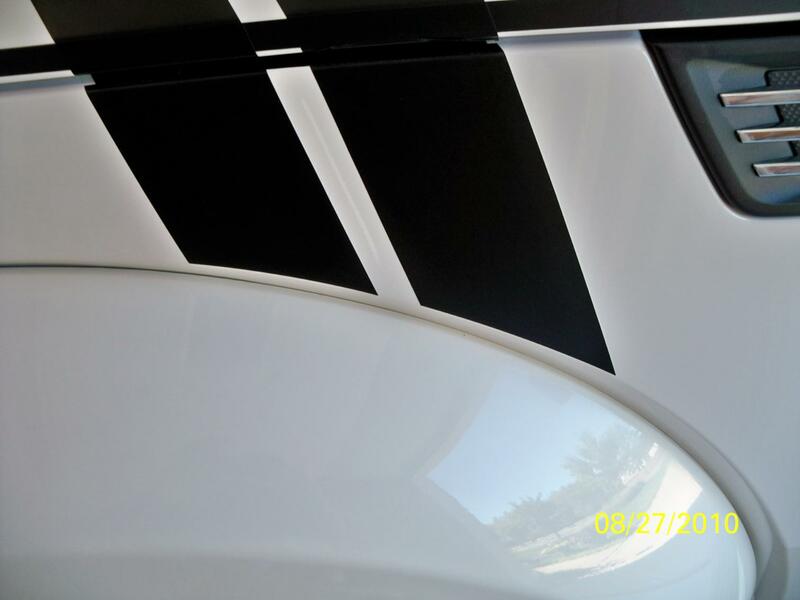 I found on my install that there was still too much body white showing between the fender and the hood viewed from the side. At least temporarily I just used 1/2 wide black electric tape in this area to cover this white area. The correct way is to mask it off aligned with the strips, and paint it flat black in my case. 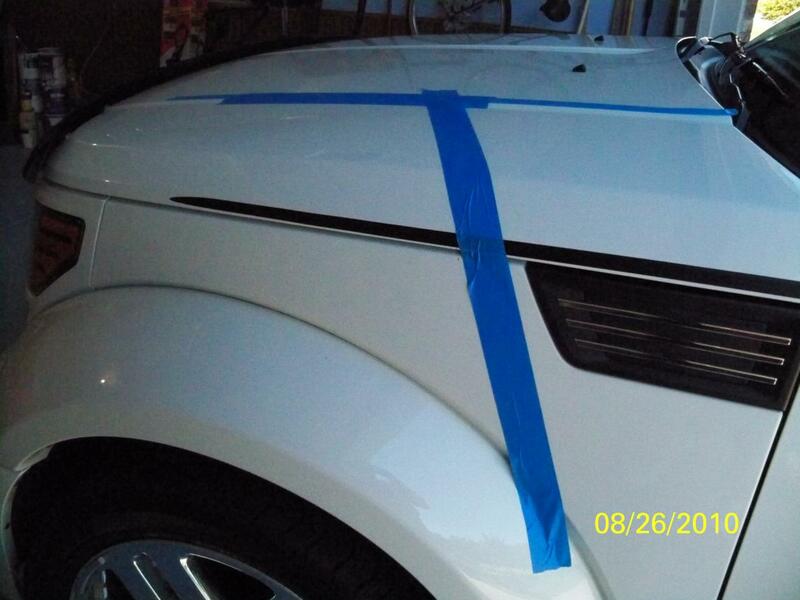 Save that Klean Strip GREEN Denatured Alcohol to use as grease & wax remover. 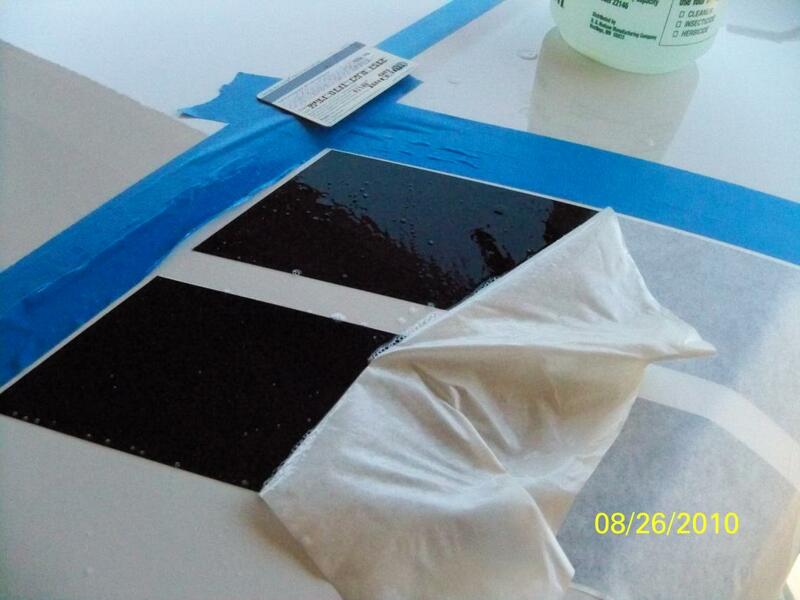 WOW it really works great (with a scrubber pad) not only on road tar but over-spray and factory adhesive. I decided to start detailing my Nitro and found that all door jams needed cleaning. This stuff really works better than anything else I have ever bought. Give it a try, you will have plenty left over from installing the decals. 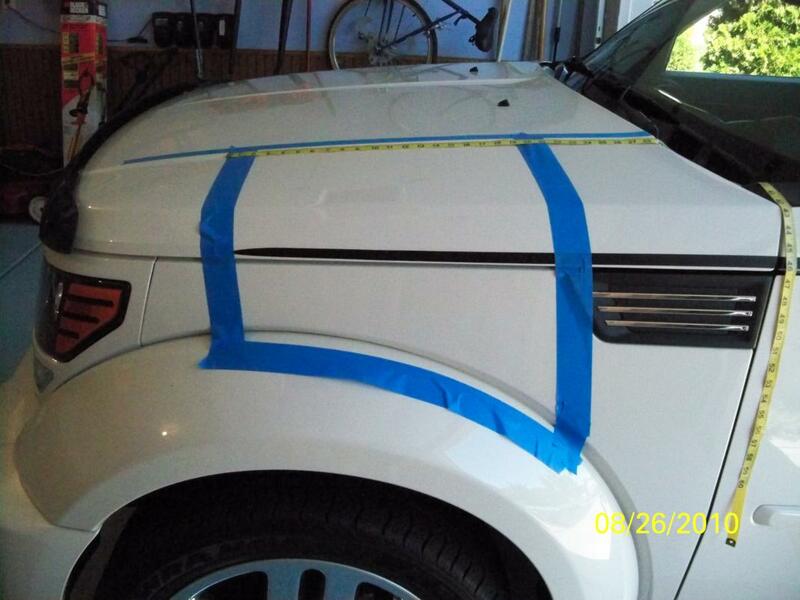 WOW it really works great (with a scrubber pad) not only on road tar but over-spray and factory adhesive. I decided to start detailing my Nitro and found that all door jams needed cleaning. This stuff really works better than anything else I have ever bought. Give it a try, you will have plenty left over from installing the decals.I found on my install that there was still too much body white showing between the fender and the hood viewed from the side. At least temporarily I just used 1/2 wide black electric tape in this area to cover this white area. The correct way is to mask it off aligned with the strips, and paint it flat black in my case. This is the only area that needs to be cleaned for the decal install and I did use denatured alcohol this time purchased from Home Depot.